We are excited to proudly highlight a different employee each month to offer an inside look into the culture and community that make up The Sembler Company. Learn more about Sembler and the people who have found a home here through our spotlight employee interviews! This month, it is Jackie Cataldo. Chelsea Rogers: What has been your favorite part about working at The Sembler Company? 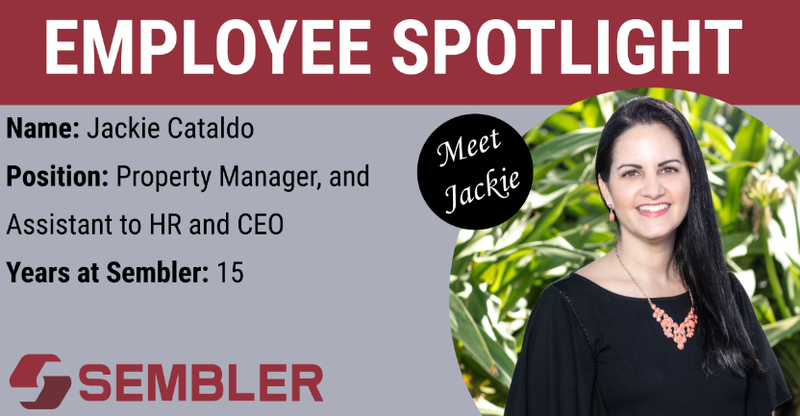 Jackie Cataldo: My favorite part about working at The Sembler Company is that they are family oriented! I also like that they get out into community and are very involved. Chelsea: What is your role at The Sembler Company and when did you start working here? Jackie: I started working at The Sembler Company in June of 2004, so I am coming up onto my 15 year anniversary! I am a Property Manager, Assistant Property Manager, Assistant to HR, and Assistant to the CEO. Chelsea: Of those roles which do you like the best? Jackie: I would have to say I like being the Assistant Property Manager best! Chelsea: What is your funniest memory from working at The Sembler Company? Jackie: So a few years ago for Thanksgiving, I was cleaning up and putting the sterno’s in the garbage. I THOUGHT they were all out but one of them must have still been lit and I grabbed it, dropped it on the table, and it started spiraling out of control and fell onto a chair. The chair immediately caught on fire. I tried to find a fire extinguisher but I found Mr. Sembler first and he and another employee had to put the fire out! Chelsea: If you could meet anyone, living or dead, who would you meet? Jackie: I would have to say Lady Gaga! I think that she is funny, interesting, very smart, and just seems like she would be a fun person to hang out with! Chelsea: Do you have a favorite Lady Gaga Song? Jackie: Poker Face! It’s so fun! Chelsea: If you won the lottery, what would you do with the money? Jackie: I would pay off our house, pay off the cars, and start a college fund for our son, Lorenzo. I would also like to help my family pay off any debt they have and then just save and invest the rest of the money. Chelsea: How about a gift for yourself?! Jackie: Probably a whole new wardrobe! Chelsea: What is the best place you traveled to and why? Jackie: My favorite place that I traveled to was Jamaica on my honeymoon. It was just two of us discovering a new place and there was all the excitement of being newly married. It was very relaxing! It was also an all-inclusive resort so we had all food and drinks you could possibly want!